During the fifty years after the War of Independence, Christmas was not an officially recognized or universally celebrated holiday in the United States—and it was certainly not observed in the way we think of Christmas today. Many puritanical communities in colonial America strenuously disapproved of the festivities and some actively banned them; during the first years of the new republic, with the Revolution and the War of 1812 still fresh, some citizens shunned the various traditions, regarding them as suspiciously English. 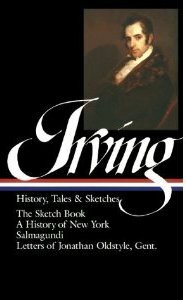 Irving’s Christmas stories were published together as the fifth volume of the seven-part The Sketch Book of Geoffrey Crayon, Gent., a series of some thirty pieces which also included such classics as “Rip Van Winkle” and “The Legend of Sleepy Hollow.” Geoffrey Crayon, Irving’s fictional alter ego, has traveled from his native New York to England and eventually runs into Frank Bracebridge, who invites him to Bracebridge Hall for an old-fashioned Christmas with his father, “the Squire”; his two brothers, “the Oxonian” and a young army officer; and the resident bachelor, Master Simon. Crayon mourns that, even across the Atlantic, holiday traditions were “daily growing more and more faint, being gradually worn away by time.” Even so, it was “still a period of delightful excitement in England.” Thus, in his four Christmas sketches, Irving both conveyed to American readers the excitement of the holidays and urged British readers not to let their traditions slip away. Some of the English traditions described by Irving will seem less alien to readers across the globe today than they might have to Irving’s own American neighbors. The fourth and last of Irving’s cycle of stories, “The Christmas Dinner,” was suggested to us for this week’s selection by Nalle Valtiala, a Story of the Week fan hailing all the way from Finland, where the Christmas writings of Washington Irving still charm readers across a distance of four thousand miles and two centuries. Notes: The epigraph is from the 1622 verse “A Christmas Carol,” by George Wither. The other poem on the first page is from John Suckling’s “A Ballad upon a Wedding” (1646). Belshazzar (p. 949) was the last king of Babylon; his infamous feast, during which God’s hand appears and writes on the wall, is described in the Book of Daniel. Verses from the traditional “Boar’s Head Carol” appear on p. 950; the first two lines in Latin mean “I bring the boar's head / giving thanks to the Lord.” Roasted crabs (p. 953, note) are not crustaceans but crab-apples. “Cupid’s Solicitor for [of] Love” (p. 956) was written by Richard Crimsall about 1640. The Lord of Misrule (p. 957) was appointed by lottery at Christmastime to preside over the increasingly drunken revelries; the practice, prevalent during the medieval and Renaissance periods, was often banned by English monarchs and church authorities. Irving’s note on the subject is from A Survey of London (1598), by John Stow. I had finished my toilet, and was loitering with Frank Bracebridge in the library, when we heard a distant thwacking sound, which he informed me was a signal for the serving up of the dinner. . . . If you don't see the full story below, click here (PDF) or click here (Google Docs) to read it—free! Way back when there was no Christmas as we know it today . Thank you for Washington Irving on Christmas Eve! I read it with interest. His stories & our Christmas are woven together like one of the Bracebridge greenery garlands he describes--even for those who don't know so. Peacock and Boar's head for Christmas feast. Wow!